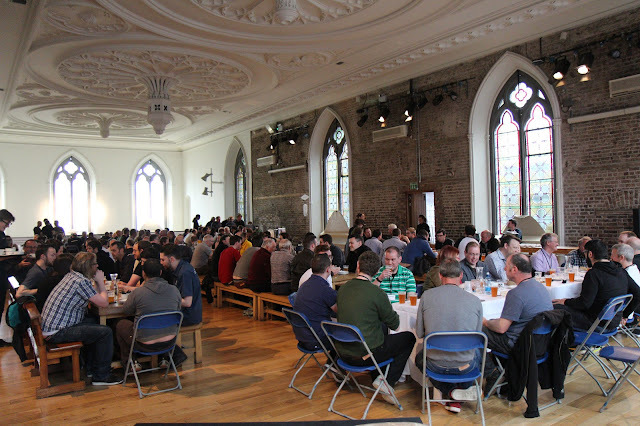 On Saturday, I attended the 2nd BrewCon in Dublin. This is a homebrew conference which seeks to educate amateur brewers on how to be better. It also has the secondary effect of perhaps encouraging some to go pro. Saturday was also the 500th anniversary of the Reinheitsgebot. The ticket price was more than compensated by the goodie bag we got which contained freebies and vouchers but the education we received was invaluable. 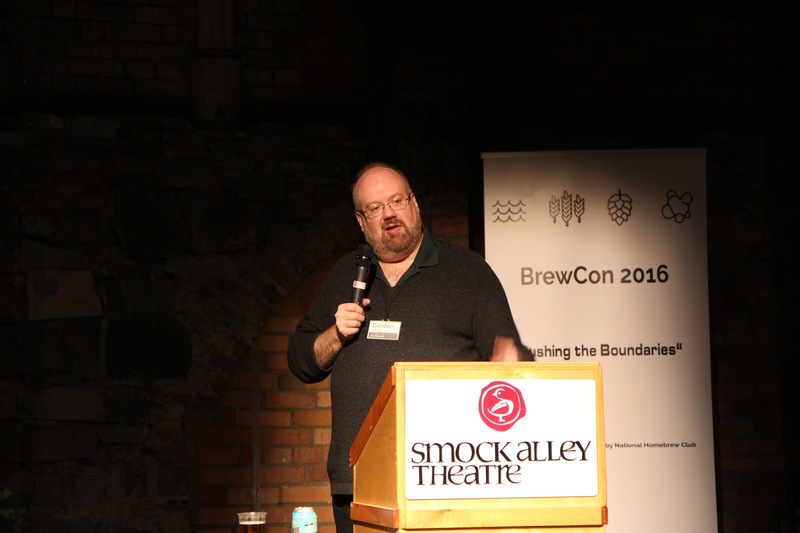 My good friend, Brendan Murphy warmed us up with a brief history of his own brewing and the path he took to winning best brewer twice and a plethora of meddles both in Ireland and abroad. He also provided some simple tips to help brew better beer as well as his trade secrets, specifically his house yeasts. While Bren is usually very technical, he decided to keep it simple because the following talks would be full of science bits. It was nice to ease our brains in to the morning. Next was Peter Dudley who went through water chemistry, one of the most overlooked parts of brewing. Peter talked about this last year but the talk was different. It went over some of what he covered last year but really expanded in to getting your PH right. Rory Sheils was back. Last year, his talk on safety left half of us petrified and the other half thanking their lucky stars they were still alive. This time, he talked about malt specifications and the impact it has on brewing. The last session before lunch was Chip Walton from the Chop and Brew blog/podcast in the US. Chip is in media and it showed. He kept us entertained while talking about pushing the boundaries with special ingredients. If it’s on his spice rack, he will probably throw it in to the beer at some point. After lunch and a few beers we had our keynote speaker. Gordon Strong, the president and foremost BJCP beer judge in the world talked to us about brewing better beer for competitions. I learned something interesting about not putting the darker grains in the initial mash to help with PH levels and instead, add during sparge as most dark grains don’t need to be mashed. This method will require a major shift in my brewing procedure if I do it. Gordon mentioned that the AHA conferences used to be about this size (less than 200), now they feature about 5000 attendees. He prefers the more intimate set-up. Next, Dr Gearoid Cahill talked to us about yeast and fermentation and how the magic occurs. Most homebrewers don’t need to know about the science, as long as the yeast strain they use is healthy. What I learned here is that dry yeast doesn't need to be oxygenated as such, though should be re-hydrated first rather than sprinkled on. I'm guilty of the dry sprinkle myself but when I think to re-hydrate, I use the leftover runnings from the mash that has been boiled and cooled so I can be sure there are no foreign flavour profiles. It probably makes no difference but it makes me feel better. One of the most interesting session was Dr Bill Simpson’s talk on flavour profiles. I learned that scientists like himself can take simple water and add the individual chemicals that make up the flavour, aroma and alcohol profiles in a beer. What you will end up with is a clear, fizzy liquid with a white head that smells and tastes like a beer. In a fully blind taste test, it should be indistinguishable. The question he left us with was along the lines of: Is that really a beer, it tastes and smells like one. Or, is beer also about the process and history involved? 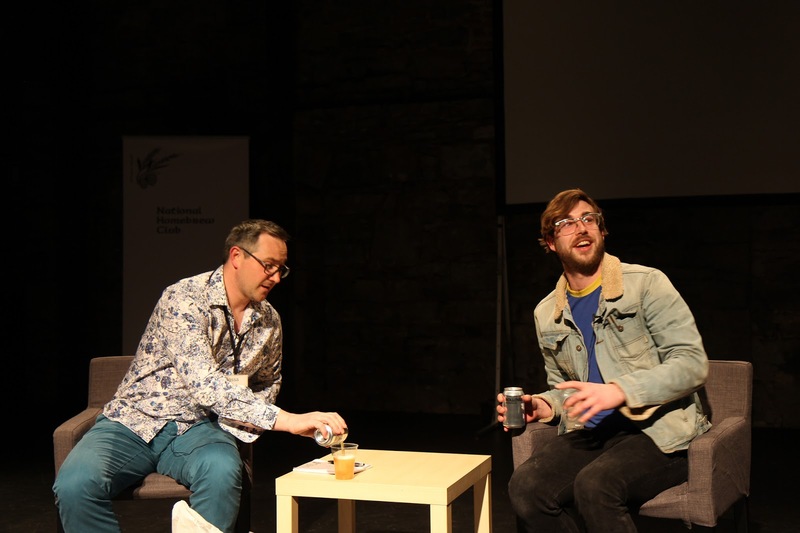 The last session was an informal interview session with Rossa O’Neill interviewing Alex Lawes, the head brewer for Rye River and his own gypsy brand of Whiplash. This was a fun and interesting chat to help us wind down from the serious stuff and prepare us for the drinks reception to come. It was a little tortuous since we watched Rossa and Alex sitting down and drink beer while we were all starting to pass out from the thirst and then all of a sudden, we were done. 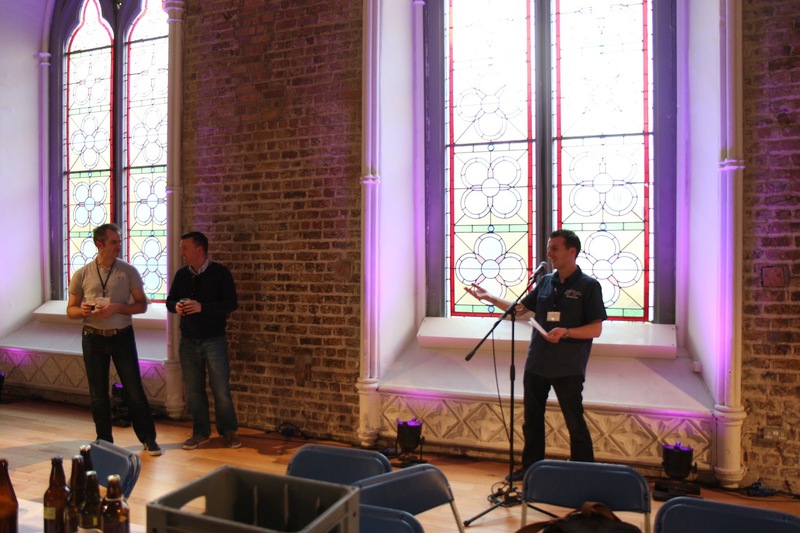 It was upstairs to the beautiful Smock Alley hall which is a bit like putting a German style beer hall with long benches inside an old church. 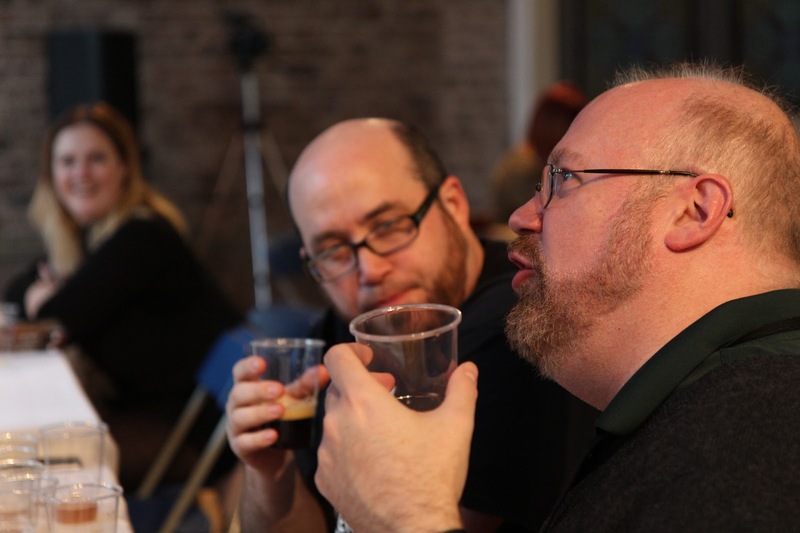 While the rest of us were enjoying the drinks reception, Gordon Strong and Chip Walton were judging beer for the Carboy Cup. Each NHC club entered a beer so the win went to both the brewer and the club. I don't recall if there was a prize but either way, there were bragging rights. There was a first and second place which was interesting because 1st place went to Roger and my club, Midlands Brewers. Second place went to Garret and my second club, Liffey Brewers. Garret is also in Midlands but tends to enter competition for Liffey. It's great when both of your clubs wins. The event was brilliant and the location of Smock Alley theatre is just perfect. The only hitch were a few laptop issues featuring the windows 10 sad face and message that something went wrong. It was sorted out quickly enough each time and didn't really take away from the conference. In fact, it highlighted the fact that at the end of the day, this is an amateur brewing conference run by amateurs and not a slick, professionally run commercial conference. The thing is, the organisational skills behind the conference might as well be professional. Here's looking forward to BrewCon 2017. You can see the full album of photos I took on the Beoir Flickr Page.